One of the defining themes of this blog is the changing nature of religion in modern society. Recent decades have shown us some dramatic changes in terms of base assumptions. The rise of the religious nones, the politicization of the conservative church, the challenges of pluralistic ground rules confronting religious particularities, are but three examples of some of these major shifts. At times, I’ve referred to this as Post-Constantinian Christianity (here’s a post from 18 months ago). Lately, following David Fitch and Geoff Holsclaw, I’ve been more comfortable with talking about “post-Christendom“. I recently returned from a week in a literal post-Constantinian society. As a 60th birthday present from my daughter, son-in-law, and grand daughter, Jeralynne and I joined them and Evgeni’s mother for a week in Istanbul. It was a great week. I left with a lot more questions to explore. I realized how ignorant I am about Eastern Europe. Most of what I learned in 20 years of school was limited to the rectangles on the map to the right. I read up some on issues of Constantinople before and after the trip, but mostly came away with more questions than answers. Nevertheless, there are some patterns present in both historic Constantinople and present-day Isanbul that provide some hints about the changes we’re experiencing in contemporary religion. 1. Constantine made Christianity the official religion of the realm, granting it new legitimacy. He commissioned the Council of Nicaea which worked out details of small-o orthodoxy. In addition to Hagia Sophia (above) he built the Church of the Holy Apostles, an Orthodox church designed to contain relics of all twelve disciples (they never got all the relics). These two issues of policing the borders of orthodoxy and looking to the past are issues our contemporary church know far too well. 2. There was a tendency to see religious expression as a sign of social status. Justinian rebuilt Holy Apostles because it wasn’t “grand enough”. Building great edifices were built partly as personal expression. 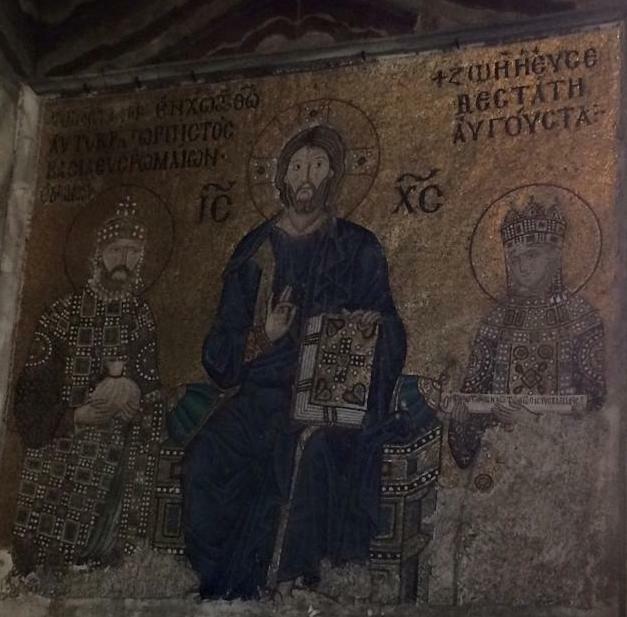 When he finished Hagia Sophia, he said “I am now greater than Solomon.” This pattern continued, as the mosaics in Hagia Sophia illustrate (the picture below is 11th century Emperor Constantine IX Monomachos and Empress Zoe giving bags of gold to Jesus in support of the church). Our contemporary focus on big churches and celebrity pastors has a long history. 3. Schisms and fights over “the real church” are part of this religious history. The tensions between the Orthodox church and “the Latins” (which may have involved much more than religious ideology) resulted in the Massacre of the Latins late in the 12th century. Nearly 60,000 adherents of the Roman church were killed or exiled. Twenty years later, the Fourth Crusade diverted its target from Jerusalem to Constantinople and effectively sacked the city. The resulting weakened empire was incapable of holding off the eventual Turkman invasion, headed by Mehmet II 200 years later. 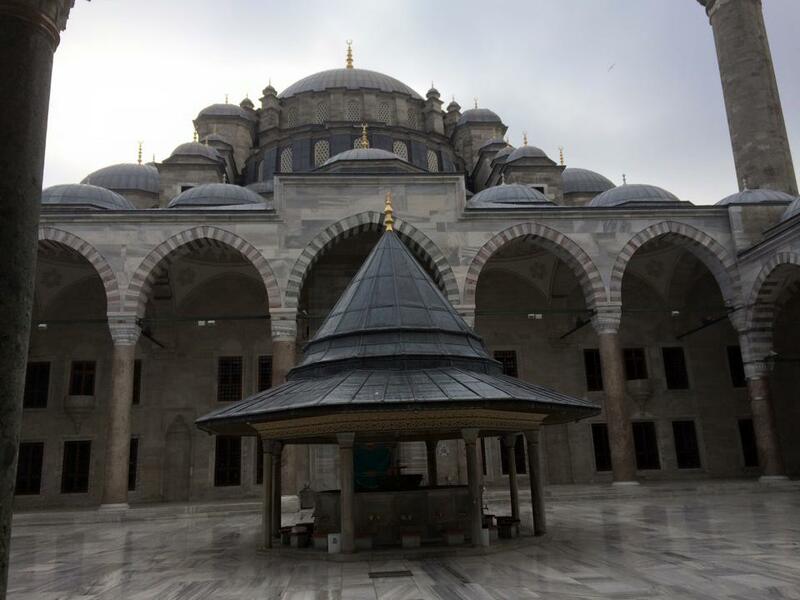 When Mehmet came to power, he replaced most of the churches with mosques (and eventually built the Fatih Mosque on the site of the Church of the Holy Apostles). My takeaway here is that the infighting within the church over who are “real Christians”, who is reformed, who is progressive, who is “Bible-believing”, etc. all weaken the witness of the True Church and leave us at a point where we are weakened in the face of the surrounding culture. 4. Modern Istanbul, especially the part of the city where we were staying, is characterized by secularism. This was part of Attaturk’s intent in creating a secular society. While 99% of Turkey is Muslim and call to prayer is announced from the loudspeakers five times a day, most people seemed somewhat oblivious. I saw a couple of women in traditional dress who turned east at a call to prayer but they were far outnumbered by people simply going about their business. This suggests that there is a strong sense of religious identification that is separate from regular religious practice. If you asked people, you’d learn they were Muslim but it would be hard to tell them from other folks. This pattern of cultural religion is very common to us in America (as my regular rants about polling data illustrate). 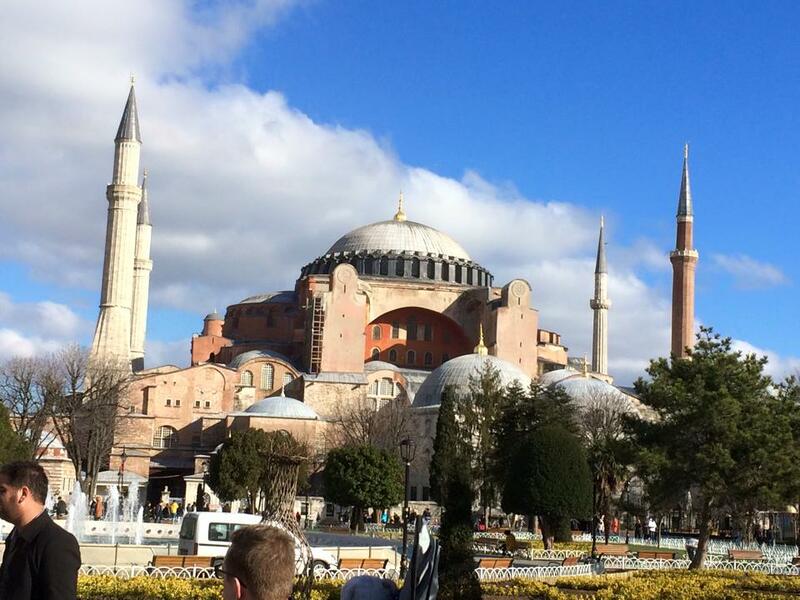 In fact, after a week in Istanbul, I came away with the sense that the de facto religion is consumerism. Lots of stores and shops — and don’t get me started on the experience in the Grand Bazaar. But consumerism combined with nationalism may well be a default religion in America (for evidence, just search “Christian responses to American Sniper”). I’m sure I’ve missed quite a few nuances. And if I were in other parts of the city or the nation, I might have a very different sense of religious diversity. But I’m still struck with the idea that there is much to learn by looking at American religion through the lenses of another culture. 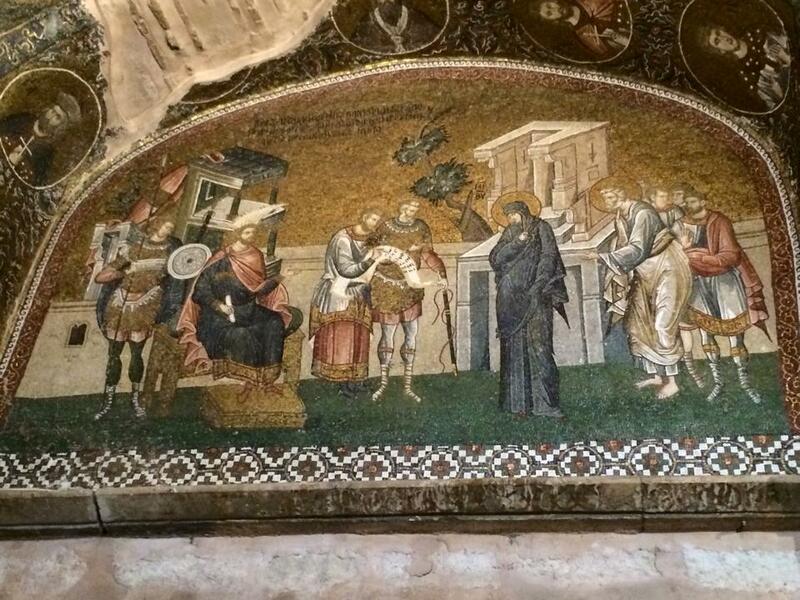 One of my favorite sites was the Chora Church, which had remarkable frescoes on the walls and ceilings. Even though we couldn’t get into the main part of the building, what we saw was stunning. It was some of the clearest illustrations of Christianity’s long theological tradition. In this illustration of the Trial of Christ, we’re reminded that Jesus stood apart from cultural and political struggles. This is a good lesson for us to remember. I can’t wait to pick your brain more about this!